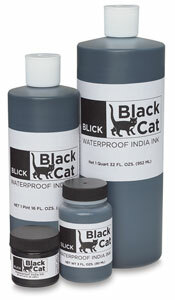 Dense black, opaque, pigmented ink works well in technical pens and airbrushes. Won't smear and is permanent and fadeless. Sizes in glass bottles with pipette, plus plastic bottles.